Well, Santa is well on his way now, getting the boys all warmed up for that big trip Thursday night, so it's time to get into the real Christmas spirit. 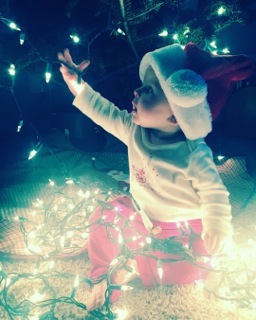 And, I've chosen to help you get there by publishing this magnificent image of our great-niece, Miss Harper Hartte Cunningham, age 8 months, taken by her mother Kayla as they began decorating her first Christmas Tree in their Omaha home. This is such a grand photo - taken with an Iphone - that I just had to share it with you all. This year we here at A Bubbling Cauldron wish you all a very Merry Christmas. We hope your new year will be fantastic - full of hope and promise for better times. We want to thank each of you who read these entries for your support. Even though fewer of you comment on these pages we know you're out there reading because many of you send private messages on issues addressed here. We'll continue to try to provide you with timely, accurate information and our opinion on what that information means. We want to thank the wonderful employees of the City of Costa Mesa for your continued loyalty and diligence supporting my city. Each of you work hard and do your individual jobs with great professionalism. We know how difficult these past few years have been for you all, and hope this year brings change. We hope it finally brings new contracts for the Public Safety organizations, who have been working without a new contract for nearly 550 days at this point. I also want to express my gratitude to those residents to take the time to be involved in the important issues facing our city these days. We know how difficult it is for you to step up and speak up on tough issues knowing that you'll get ridiculed and rebuffed by some of our elected leaders. We know that many of you have been treated unfairly this year, but hope the November elections will shift the majority to bring some civility back to our city council. ENJOY YOUR HOLIDAYS.... I'LL BE BACK! So, to each of you, we hope your holiday is very special for you and that the new year brings all you hope for. We're turning down the flame under the old cauldron for a few days, but will be back right after the new year to continue to inform and provoke you. My plan was to put off any political rhetoric for the holiday season, but the City of Costa Mesa threw me a curve ball that requires me to let you know about something that will be sprung on you at the first City Council meeting of the year, on January 5, 2016 - something that was sprung on me today, two days before Christmas and less than a day before everyone at City Hall takes off for the holiday and is therefore unable to answer questions about it... I've been trying for a couple hours. At the very end of the agenda, which has some other interesting things on it as well, is this little piece, New Business #1 at the very end of the agenda, misleadingly titled, "Changes To The Temporary Sign Code/Policy", which you can read in it's entirety HERE. Provide direction to staff as to any changes City Council wishes to make to the existing Sign Code or policy as it applies to all temporary signs, including political campaign signs. Also direct staff on their participation in filming/video production of candidates’ forums and inclusion of such forums on the City’s website. So, without any reference to it in the title of this staff report, a solicitation for direction on filming/video production of candidate forums is stealthily included in this item. The staff report goes on and on at great length discussing why changes need to be made to our sign policies, primarily due complications with campaign signs. I agree that this is something that needed to be tightened up considering all the turmoil around campaign signs, including the bogus arrest of employee Steven White, who was tried and found not guilty of that crime - stealing signs worth maybe $10! So, yes, let's clarify and tighten up the rules, by all means. CUTTING YOU OFF FROM INFORMATION! As to filming of candidate’s forums, staff and the City Attorney would also recommend that City staff be directed to not participate in the filming or video production of any candidates’ forums and that such forums recordings not be placed on the City’s website. Staff feels that with the new technology available today there are many alternatives and options available for City residents to view the various forums without involvement of City staff. Let me tell you that this reeks! Our City government pontificates constantly about how "transparent" it is - citing all the frills and do-dads of transparency, while failing badly where the rubber meets the road. There can only be ONE reason for this recommendation - certain politicians don't want the public to be able to see them in action in public campaign forums! During the last few campaign seasons we saw around 300 people attending the most popular forums - in a city with more than 50,000 registered voters. Thousands of others certainly watched the taped replays provided on CMTV during the run-up to the election. If the politicians have their way, those thousands will be shut-out of the process. That staff recommendation refers to "new technology available" and "many alternatives and options". Really? Just what would that be? I'm presuming they mean the likes of Barry Friedland's Costa Mesa Brief coverage, in which old Barry may choose to edit to his little heart's content and edit out objectionable (to his partisan pals) segments. Or, you always have your old pal here at A Bubbling Cauldron, who tries to attend every such event and report what he sees for your consumption. Certainly you DON'T want me to be your only source of information, do you? So, carve out a few minutes to write to City CEO Tom Hatch (just click on that name for the email address) to let him know how you feel about this. If you feel you're getting shut-out of information regarding the upcoming campaign season by the implementation of this action, let him know. Personally, I think it's yet another example of how those currently in power are choosing to decide for you what you will see - just as they try to control what you can say. Don't let them get away with it!